Travel Translator converts text from one of 40+ languages to another. 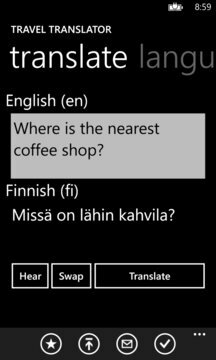 Speech audio output for the translated text is supported for most languages (Windows 8 Phone). History of translated words and phrases. Useful and common phrases to translate and map included in the application. The application now also supports sending a SMS or email of the translated text.